I have just graduated with a First Class Honours degree from the Royal Academy of Music, where I studied with Christopher Cowie, Ian Hardwick and Sue Bohling. I have recently performed with orchestras including the Philharmonia, Orchestra of the Royal Opera House, Britten Sinfonia and Oxford Philharmonic. 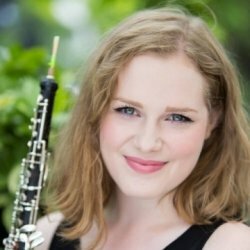 Whilst studying at the Royal Academy of Music, I won both the Leila Bull Oboe Prize (2018) and the Grimaldi Cor Anglais Prize (2015). I also won the Katie Thomas Memorial Prize for overall achievement, hard work and good conduct. Before studying at the RAM, I spent 10 years at Chetham's School of Music in Manchester, near where I'm originally from. In my last year at the school, I was also Co Principal Oboe of the National Youth Orchestra of Great Britain. From 2016-2017 I was a member of the prestigious Gustav Mahler Jugendorchester, participating in three European tours and a three week long residency in Abu Dhabi. As a member of the GMJO, I had the opportunity to perform in Europe’s most prestigious concert venues, including Concertgebouw Amsterdam, Teatro Alla Scala Milan, Vienna’s Musikverein and the Elbphilharmonie in Hamburg. In 2015 I was a member of the LSO Woodwind Academy. I am currently teaching oboe and piano privately in West London and am a tutor at Wandsworth Schools’ Music. Being trained at a specialist music school, I was very involved in outreach work and music in the community, working with people of all ages. I have been trained to teach oboe and lead workshops, and have had practice at this during school outreach days and trips to other schools. I was also chosen to be a member of The Commonwealth Resounds team including other students from Chetham's School of Music, The Purcell School and conservatoires such as the Royal Academy of Music, for their trip to Sri Lanka in 2013. This involved a lot of outreach work in schools and orphanages, where we led workshops and gave group music lessons. I aim to ensure that each student is able to fulfil their potential and reach their goals, through a supportive and encouraging approach to tuition, regardless of age or ability. I tailor lessons to each individual's needs, in order to ensure each student gets the most out of their lessons. I make sure to involve and engage the student as much as possible in the lesson by asking lots of questions and using rhythmic games and exercises. I demonstrate regularly, modelling good technique and posture. I believe that whilst learning a musical instrument requires hard work and practise, it should also be an enjoyable experience. As I am a young teacher, I believe my approach to tuition is full of energy, and that my friendly and open personality means that I am very approachable, both from a student's and parent's point of view. ImogenFrom Mele (5/5): Carry on doing what you’re doing so well, as the boys are really enthused to learn. And thank you! ImogenFrom Veselina (5/5): Imogen is lovely person and encouraging teacher, my boys are excited to have piano lessons now and are looking forward to the next lesson. Reply from: Imogen: Thanks for your feedback Veselina! The boys are a pleasure to teach!